South Africans Ponder A Nation Without Mandela : Parallels The anti-apartheid hero has been a unifying force in South Africa, particularly for the ruling African National Congress. There's concern, however, that xenophobia, racism and political infighting may grow once the "father of the nation" dies. A well-wisher uses his phone to take a picture of a banner of photos of Nelson Mandela outside the Mediclinic Heart Hospital in Pretoria, where the former South African president is being treated. From the township of Alexandra in Johannesburg, shack dwellers can look across a ravine to the spires of Sandton City, which houses the most lavish shopping mall in sub-Saharan Africa. Alex, as this slum of roughly a half a million people is known, was home to Nelson Mandela when he first moved to Johannesburg in 1941. The small house where Mandela rented a room is marked with a plaque, but the yard is littered with trash and construction debris. The concrete wall around the compound is collapsing and someone has spray-painted, "Do not pee here" in Zulu slang across the front of it. "South Africa is poor, brother. Poor, poor," says Wellington Nzuza, standing nearby leaning against the compound wall. He says the biggest problem in South Africa is that people don't have work. When Mandela dies, watch out, xenophobia is going to come up again. "Every [person] you see ... no work. No job. No nothing," he says. "South Africa is poor." Mandela has now been hospitalized for more than a month in Pretoria, about an hour's drive away. Even as officials and family members say the 95-year-old is slowly improving, the country is moving toward a post-Mandela era. The anti-apartheid hero has been a unifying force in South Africa, particularly for the ruling African National Congress. There's concern, however, that xenophobia, racism and political infighting may grow once the "father of the nation" dies. Brian Raphela calls the African National Congress corrupt. The 26-year-old says Mandela's former liberation movement turned ruling political party is now just making a small group of its own members rich. "There's nothing they [are] doing for us. They only do it for themselves," Raphela says. "If you can check them, they're driving big cars, they're living in fancy houses, but me, I don't even have a place to stay." Raphela is among the unemployed who have become disillusioned with their parents' revolution. Unemployment in South Africa officially sits at 25 percent, but many people suggest that it's far higher. Raphela says he steals to survive. "Even now, when I look at you, I think of snatching your bag so I can buy something to eat," he says. As much as Raphela dislikes the ruling ANC, he has even more animosity toward African immigrants from Zimbabwe, Somalia, Nigeria and other parts of the continent who he says are stealing South Africans' jobs. "Each and every day they come here ... in numbers, maybe a hundred every day," he says. "In one shack you get maybe 15 people." Raphela says the ANC, starting with Mandela, allowed these other Africans to flood into the country. But he claims that's going to change when Mandela is no longer alive. 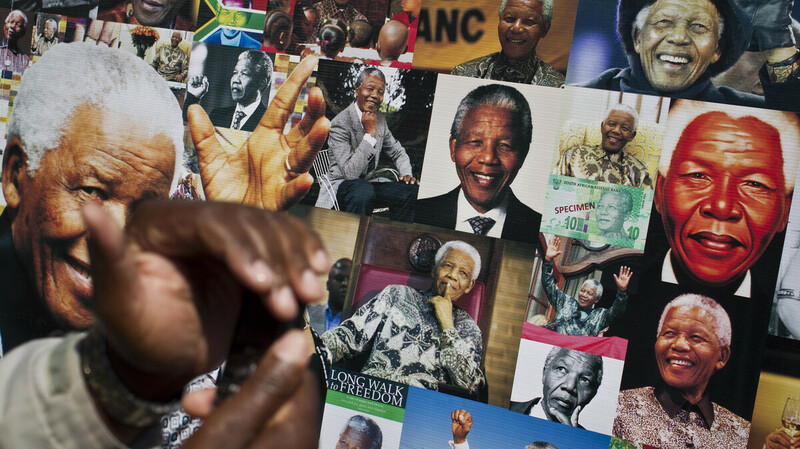 "When Mandela dies, watch out, xenophobia is going to come up again," he says. Migrants in the country say they too worry that xenophobia will again rear its head after Mandela dies. In 2008, attacks across South Africa left dozens of migrants dead and hundreds injured. Earlier this year, there were more assaults on immigrants. Outside Mandela's hospital in Pretoria, a group of Ethiopian refugees came to pay respects to the ailing former president. Abdurahman Musa Jibro says Mandela has been the moral conscience of the nation and he's worried that refugees will lose some measure of protection once Mandela is gone. "Actually, we feel it. We'll not be safe," Jibro says. "That is what the majority of foreigners — especially the refugees [and] asylum seekers — [think]." It's clear that South Africa right now is facing daunting social and economic challenges. There's the growing gap between the rich and the poor, and there have been divisive calls by some black groups to exclude South Africans of Indian descent from affirmative action programs. One of the gold miners unions is demanding a 100 percent pay hike in ongoing contract talks with gold producers. Some young people such as Raphela say the new democratic South Africa ushered in by Mandela two decades ago still hasn't lifted them out of poverty. Ahmed Kathrada, a senior ANC figure who was imprisoned with Mandela, says the expectations of South Africans about the pace of change have been unrealistic. "When President Mandela got elected, there were people saying, 'Where's our house?' the next day," Kathrada says. The ANC government has launched huge projects to deliver clean water and electricity to the poorest of the poor. Kathrada notes that racial integration has occurred at many schools, and blacks now have significant stakes in most South African businesses. Kathrada also notes the ANC had the daunting task of guiding South Africa from white minority rule to a multiracial democracy. "When we came to [the] government, the civil service, the army, the police, industry, agriculture — everything was ... in white hands," he says. "We did not even know how to run a town council. We never voted. Never saw the ballot box." Despite the calls for more rapid change, Kathrada says the country has done a reasonably good job of making that transition. He's confident that even after Mandela dies, the vision of Mandela and the anti-apartheid movement for a more just, democratic South Africa will endure.